An excellent option for blocking out light is a window shade. Control the amount of light by selecting a roller shade, honecomb cellular shade, Roman shade, or other style that have proven features. The well-known coveted Good Housekeeping Seal has been a standard of excellence since the Good Housekeeping magazine (founded in 1885) created the 1900 Experiment Station later renamed in 1902 to Good Housekeeping Research Institute (GHRI) that predated the FDA (Food Drug Administration). Blinds Galore offers the Blackout Roman Shades with that seal of approval. The most well-known type of window shade to block out the sun is the Roman shade. It's designed with a unique look that when opened, stacks upon itself in even horizontal panels. When closed, the shade has a ribbed look similar to vertical blinds. Blinds Galore customers are pleased with this shade. One customer commented, "love them" and that the shades "block the glare from the window on our tv." Another customer commented how well the shade blocks heat from the window. Cellular Slumbershade™ is the official cellular shade of the National Sleep Foundation. It has some unique features that ensure light will be blocked from the room windows. This shade has some unique features. Specially designed notched bottom end caps fit snuggly along the blackout sidetracks. Sidetracks are lined in while the rail facing the room is white. Fuzzy top seals along the head rail creates a light barrier. Double and single cell options are available. Limited lifetime warranty is offered. Blinds Galore customers are pleased with their purchased. Some of the comments include, "These blinds are amazing for blocking out light", "Absolutely no light escapes thru" and "These shades are very well made and block out all light". One of the most recognized names in the window blinds industry, Select Blinds boasts that it's "the most reviewed, highest rated window fashions company in the world," with over 200,000 customer reviews, mostly positive. Select Blinds products have been featured on several home-improvement and building related TV shows like a December 2014 episode of Tiny House Nation that featured Select Blinds blackout roller shades and episodes of NBC's American Dream Builders in 2014 where Select Shops products, including Select Blinds, were used. If you want a different look for your roller shades, then you may decide that the cordless @Home Collection Solids Blackout Pleated Shades are the perfect find. Designed by the popular HGTV designer Carriann Johnson, these pleated shade feature no holes in the front that give added privacy to your rooms. Pleated Shades @Home Collection shades are created by creating pleats in the fabric so when the shade is opened, the fabric will fold neatly onto itself. The folds then rest at the top of the window, usually out of sight. Privacy factor is 5 out of 5. The three-year limited warranty is free, although there are options to purchase extended 5-year limited and 5 year unlimited warranties. Inside or outside window frame mount are available. Choose the headrail option of oil-rubbed bronze or brushed nickel instead of fabric wrapped. Colors: Nine solid colors include ash, Aspen white, bison beige, brown sugar, cottonwood, iconic ivory, maple grove, pinecone, and storm; shade backing (street side) is a neutral color. Samples: Free fabric samples available. Select Blinds customers are very pleased with these shades. One customer wrote, "I need darkness b/c I am a shift worker and these blinds are the best." Another customer was very impressed with the quality and appearance, remarking, "They look and feel expensive and give our sunroom a sleek, contemporary look at a great price!" One customer stated the shades worked better than her blackout curtains. This Boston, MA company's manufacturing plant is located in Northern Ireland and serves international customers, including the U.S. BlocOut shades were evaluated independently by the BBA (British Board of Agrément) for insulation properties when the shads are closed. 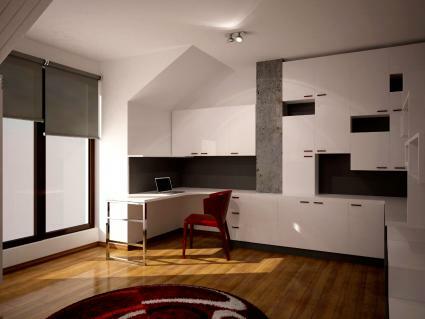 The results revealed that the shades provided up to a 43% reduction in heat loss. If you get tired of your blinds, you can change them easily with the Fabric Changer design. Simply select a different shade fabric and easily exchange with your existing one. Choose either blackout or light filtering options. Sizes: The BlocOut shades are customized to fit each customer's windows with choices of width and length. BlocOut 40 (smaller windows) and BlocOut 80 (larger windows). Colors: Select from solid colors, patterns, and textures. Blinds & Shutters magazine notes that the shades are award-winning options for customers. In 2012, the BlocOut shade was awarded the Best Energy Saving Product/Service by the British Blinds and Shutters Association (BBSA). In 2013, the BlocOut shade was award the silver medal at the prestigious House Beautiful Awards. John Lewis customers are pleased, commenting, "They are amazing." One customer has used them for four years and purchased enough for every bedroom in her home. The Comfortex award-winning Blackout Symphony Cellular Shades (The Insulator) are highly praised and provide nearly complete blackout to a room. The patented double-honeycomb shades utilize an integrated foil technology. This feature helps to maximize the shade insulating properties. The honeycomb is made from non-woven polyester fabric and further enhances The Insulator's blackout capabilities. Colors: Fourteen different colors are available. In 2008, the Window Covering Manufacturers Association (WCMA) awarded Comfortex Window Fashions its Product Innovation Awards Competition for the Symphony Blackout Double Honeycomb Cellular Shades. Comfortex has received over 38 industry awards. Customers at Blindsaver are pleased with their purchases. Comments include, "The blind works great for light control, temperature regulation and privacy" and "Blocks light". After two years of use, one customer had issues but the product warranty covered replacements. Get ready for the ultimate in modern blackout shades with the award-winning QMotion Advance Shading Systems for Roller Shades. These motorized shades give you more options than you'll ever need. 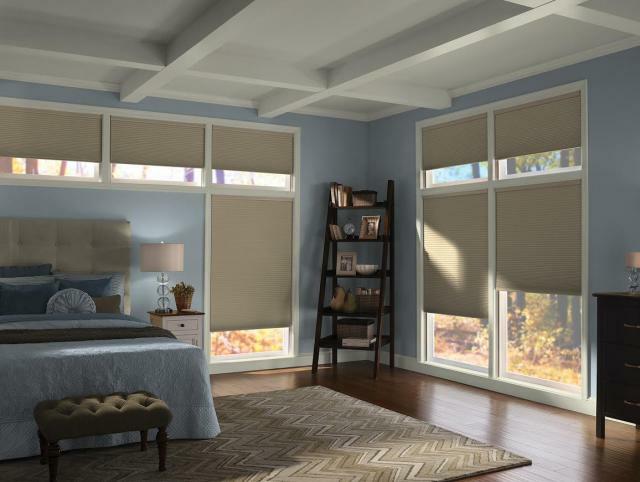 You can customize these sophisticated automated shades through style, color and even with the number of binds. For example, you can use two shades together-one for blackout and one for those times you only need light-filtering shades. Battery life expectancy of 3 to 5 years or more. Shade fabric can be detached easily from tube. Narrowest roller shades operated by batteries (located inside rollers). 2015 CEDIA Best of Show Winner for Wired and Wireless QIS Automated Shades. 2014 WCMA Best New Technical Enhancement Award for innovative Motorized Honeycomb Shades. 2012 WCMA Best Technical Innovation Award for advanced, battery-operated, motorized Roller Shades. program, and allows for great customization setup" and "They look great and operate perfectly". There are many styles and designs for blackout shades. You can use them for different rooms, such as a west facing living room, child's nursery and other rooms where the sunlight is too strong. This window treatment is ideal for a bedroom to ensure a good night of sleep.